My daughter and I have both been trying to eat healthier, drink more water and get more exercise. She’s been doing really good with all three, waking up at 5 am getting her yoga in (yes, she’s only 16! ), drinking tons of water and finding ways to creatively add healthier choices into her diet. We both know neither one of us gets enough calcium into our diet. Here’s a secret – we don’t really like milk. So we find other ways to add it in, like eating yogurt and cheese. But it’s still not enough. 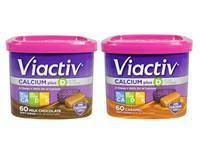 This is where Viactiv comes in, the #1 doctor recommended calcium supplement chew. When I found out that 86% of teen girls are not getting enough calcium in their diet, that it plays such an important role in not only building strong bones and teeth, but muscles as well; I knew I needed to make a commitment to making sure my daughter received the calcium she needed. She’s 16 and by the time she’s 20 – which is way too close – she will have reached about 95% of her peak bone mass. You can read much more about teens and calcium, including how much they should be receiving, multivitamins and calcium on the Viactiv page dedicated to teens here. My daughter and I have been eating one to two of these chews a day, committing to each other to Build Strong Bones. We take them with meals, so it’s easy to remember. My daughter prefers the milk chocolate flavor and I prefer the caramel. The picture frame we’re holding above is full of photos of us together and photos of my daughter. Without getting too weepy, because believe me I can go there when talking about my daughter, she is one of the most important people in the world to me. We share a bond that I had always hoped I would have with my daughter. I treasure our relationship and I value her health. I’ll do anything I can to make sure she is as healthy as possible. Do you have a special girl or woman in your life who you would like to make a commitment with to Build Strong Bones? Buy her a box of Viactiv and start a conversation about it. Be sure to visit the Viactiv Facebook page for updates! This is a product-provided, sponsored conversation that contains affiliate links. I received two full-sized canisters of Viactiv® Calcium Soft Chews and a picture frame for my own personal use. All opinions, text and experiences are my own.